There is no parenting book that can even come close to describing the rollercoaster of a journey you will embark on when you have a child with special needs. Even the section of the parenting book that mentions disorders and syndromes is laughably sparse. There is no book that can tell you how rewarding, heartbreaking, inspiring, and empowering being the mother of a child with special needs can be. When you have a child with special needs you throw those parenting books away and write your very own. We expected a child with a clubbed foot. A clubbed foot my husband and I could handle; worse things could happen. Then the worst happened. There are no words to describe the utter devastation we felt when the pediatrician came in to our hospital room and told us that our child had a genetic disorder and had to be rushed to Cincinnati Children’s Hospital. What we had expected turned into what we had least expected. No parenting book can tell you how to survive your whole world being shattered because the child you had expected isn’t what you got. The parenting books tell you to expect to come home anywhere from one to three days after your child is born. 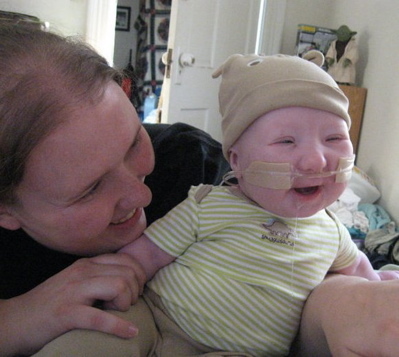 Spencer came home 83 days after he was born with a feeding tube and oxygen. Every day we went to the hospital to see him, and every day another item was added to the list of things “wrong” with him. Even some of the best geneticists in the country could not figure out what was going on with Spencer. Every genetic test result came back clean, yet doctors still insisted that he had some type of disorder. 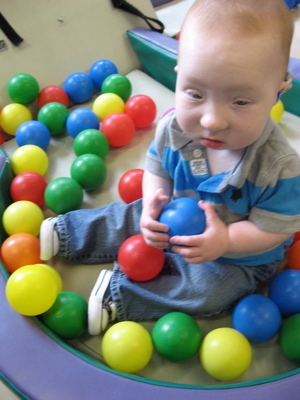 Spencer was born with Pierre Robin sequence with bronchomalacia, laryngomalacia, and tracheomalacia (floppy airway); micrognathia (small jaw); cleft palate; cranio-facial muscle weakness; feeding difficulties; hypothyroidism; contractures in his hands, left knee and feet; unilateral club foot; heart defects; ptosis (droopy eyelids); hypotonia; obstructive and central sleep apnea; and assorted dysmorphic features. Eventually, he would also be diagnosed as hearing impaired and farsighted. My husband and I struggled with the idea of having a child who could possibly be learning disabled. 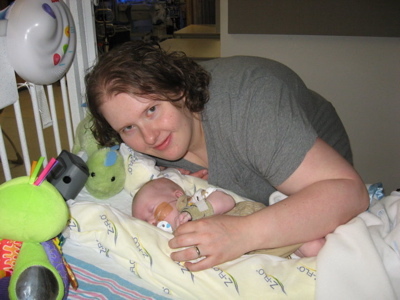 Since we had no genetic diagnosis, we had no idea what Spencer’s future held. We knew we could handle any physical disabilities thrown at us. The most devastating news to us would be that Spence would have severe mental disabilities. And with those words of advice, we have written our own parenting book. We have always celebrated all the cool stuff Spencer can do, not what he can’t. We have never told him he cannot do something, and we never will. We treat him like we would any other kid, although sometimes with minor adaptations. We don’t let other people treat our kid differently because of his disabilities. We have learned to not mourn for the child we expected, but celebrate the precious gift we have been given instead. When people stare at your kid at the grocery store, you smile and start skipping with your child down aisle seven. This makes him giggle hysterically. You also reassure your child that people only stare because he’s so handsome. You let your kid fight for his place in the plastic ball pit. Just because my kid isn’t walking and running around like a maniac, doesn’t mean he shouldn’t get to play too. My kid doesn’t give up without a fight. You do it anyway. The one thing he looked at the aquarium made the trip worth it. When people ask what is wrong with your child, you act panicked and ask, “Oh my god, is he bleeding?” I insist nothing is wrong with our child. He is different, but not wrong. And most importantly, you celebrate the small things. Yes, I’m going to update my Facebook when my kid eats a bite of banana. While some people don’t understand why it is such a big deal, around here it’s huge! We know now that Spencer probably has Say/Barber/Biesecker/Young-Simpson Ohdo Syndrome. It’s a very rare genetic disorder without a recognized gene mutation, so diagnosis is difficult. There are an estimated 30 cases officially diagnosed worldwide. It fits, but it also means that Ohdo Syndrome will also haunt him for the rest of his life. At times the idea of potentially having a child with a severe mental disability terrifies me, but then I look at Spencer and realize either way he will be just fine. The most important parenting advice I give to other parents is you don’t give up hope. No parenting book will tell you that sometimes it is only hope that keeps you going on those bad days. Why have that child described in that parenting book when you can have so much more? Rachel Nichols is a stay at home mom to Spencer, age 18 months. She recently graduated from Northern Kentucky University with a degree in English Education and plans on starting her MA in Special Education next fall. In the meantime, she enjoys playing with her amazing kid all day, reading, and spending far too much time on the internet. 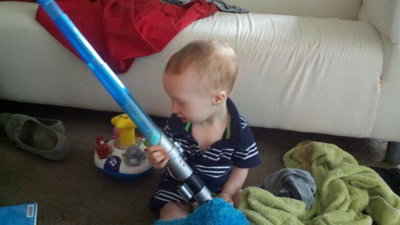 While Spencer enjoys spending time with his awesome parents, he’d rather chew on books and work on his Jedi training. The family resides in Ashland, Kentucky.